Bangkok, 24th Sept 2012: I am on my way to Indonesia for some training workshop on human tiger conflict with a colleague of mine who looks after tiger conservation in Bhutan. We are forced to spend two days here in Bangkok before we get the Indonesian visa stamped onto our passport. While waiting for the visa, two of us were getting drowned in the river of people and cars (and ofcourse today's heavy rain for about an hour, which literally changed the black tarmac road into a black out-of-the-drain river). Amidst the busy City of Life, I am reminded of the book on The Butterflies of Thailand by Yunosuke KIMURA a copy of which was presented to me by the other two authors of this book, Yamaguchi-san and Aoki-san last December during my trip to Japan. Thinking of this wonderful book, I just started wondering if Bangkok could still be a habitat to some city adapted butterflies. I looked around to some planted avenue trees and flowers and obviously could not find any butterflies. So I had to give up looking for butterflies in the City of Life and instead concentrate on walking and not bumping onto others while on the footpath or waiting for a tuk tuk by the roadside. But my friend, who back home coordinates tiger conservation works looked at this city from a different perspective of habitat. He looked from mammalian habitat point of view (being the program coordinator for tiger conservation and larger carnivores) and deduced Bangkok as a very good habitat for mammals and went looking for his species of interest. 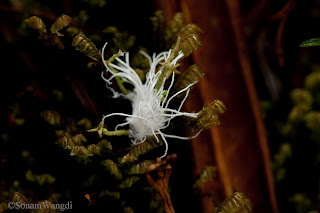 On July 18th I left Thimphu for Bumthang to go farther east to Tobrang, Trashiyangtse to conduct a small study on the early stages of Ludlow's Bhutan Glory, more specifically on its pupa with Mr.Motohiro Harada, an expert on early stages of butterflies from the Butterfly Society of Japan. The first day my travel from Thimphu to Bumthang was more or less only drive as it was drizzling all the way. And more so because i had to take control of the steering after lunch as Mr.Gyembo, an elderly man who was driving the Toyota Landcruiser Prado fell sick. 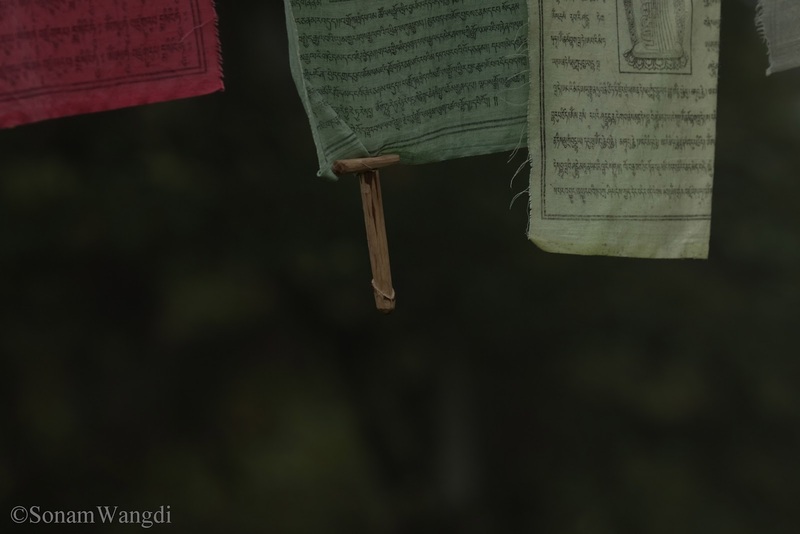 Had a tough time steering its way through the dense fog of Dorji Goempa before Yotongla. The next day was a perfect day for photographing butterflies with clear blue sky of Bumthang but as always the Chamkar Chu breeze kept the flowers swaying making it difficult for my already difficult monopod supported Canon macro lens. I treid my best and could get some little-out-of-focus pictures which I have posted for references in the future. 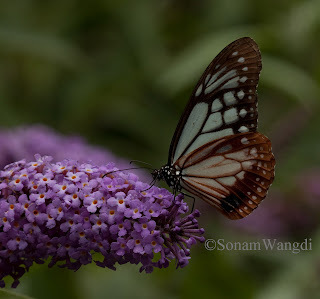 Chestnut Tiger (Parantica sita): With a wing span of 85-110mm, this butterfly is found in Bhutan, India (J&K to Arunachal Pradesh), Nepal, Myanmar, Afghanistan. 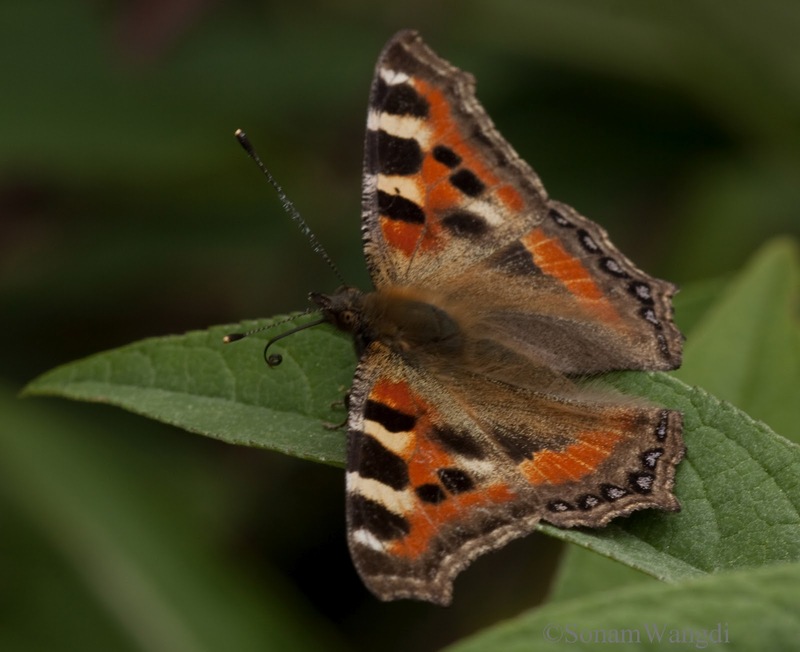 The flight of this butterfly is strong, above tree canopy and slow dipplings at times. 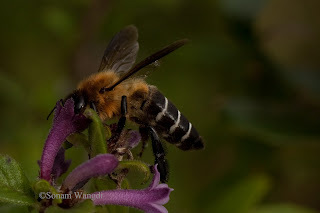 It is often seen visiting flowers from the month of April to December upto 3000m altitude. It is mimicked by Circe (Hestina nama) and can be mistaken as Chestnut Tiger to an untrained eye. Indian Tortoiseshell (Aglais cashmireinsis): With a wing span of 55-65mm, this butterflies is the most commenest among Himalyan butterflies. Its distribution ranges from Bhutan, India, Pakistan, Afghanistan. 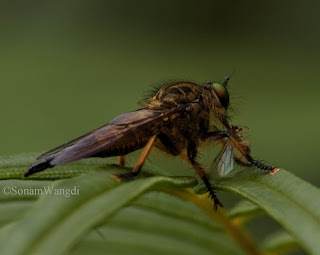 It can be seen throughout the year and loves sun as it can be seen basking in the sun with open wings. 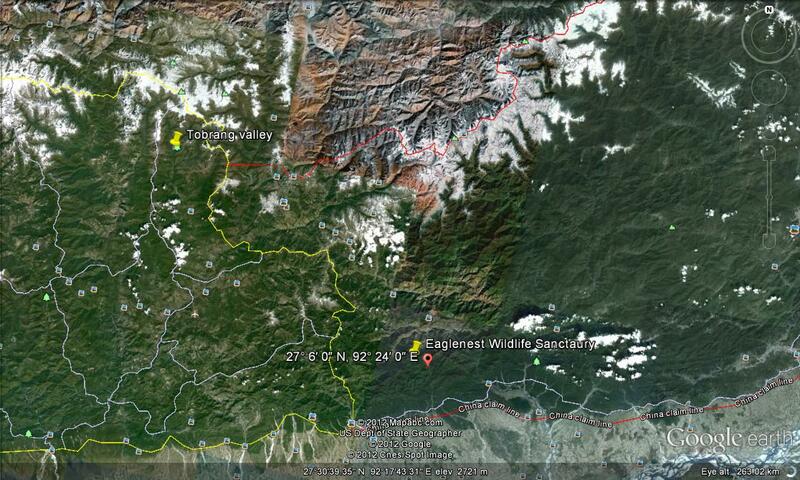 Its wide distribution can be noted from its sighting from the low grasslands to 5400m altitude. 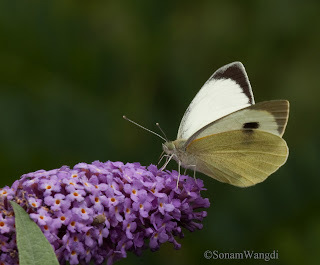 Large Cabbage White (Pieris brassicae): With a wing span of about 65-75mm it is distributed within Bhutan, India, Nepal, Bangladesh, Myanmar, Afghanistan and Pakistan. It loves open places and fringes of agricultural fields. Usually seen fluttering and visitng flowers. Found between 900-4000m altitude. Painted Lady (Vanessa cardui): With a wingspan 55-70mm, it is commonly found in Bhutan, Nepal, Sri Lanka, Bangladesh, Myanmar, Pakistan & Afghanistan. It is swift flier and prefers open grassy land. 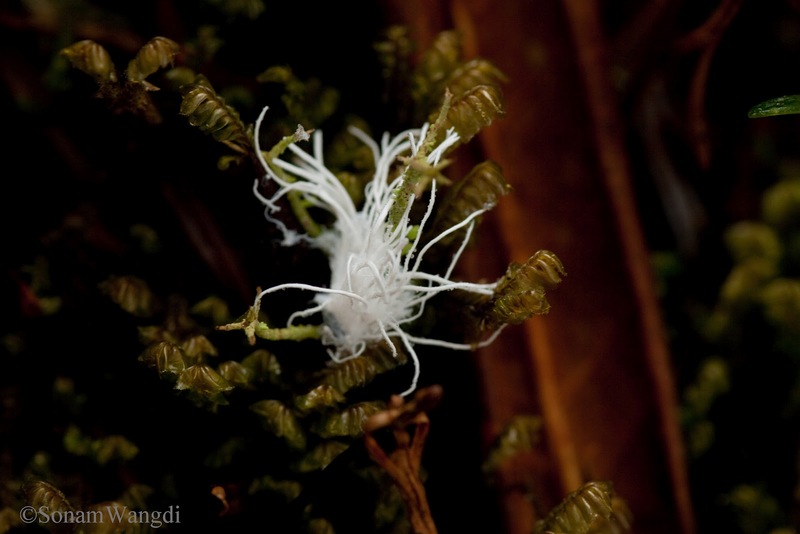 It can be found from lowlands to 4500m altitude. It can be seen visiting over ripe fruits and flowers. Anyway, we began from Thimphu a little before 0745Hrs to reach Dochula at 0840Hrs, only to find Dochula fogged. (not a good weather for butterflies). But the fog couldnt stop us from climbing the trail to Lhungchutse Goempa. Throughout the trail we couldn't get even a single common butterfly picture, forget about getting the picture of Teinopalpus emperialis:Kaiser-i-hind (Because i was hoping to at least see it). 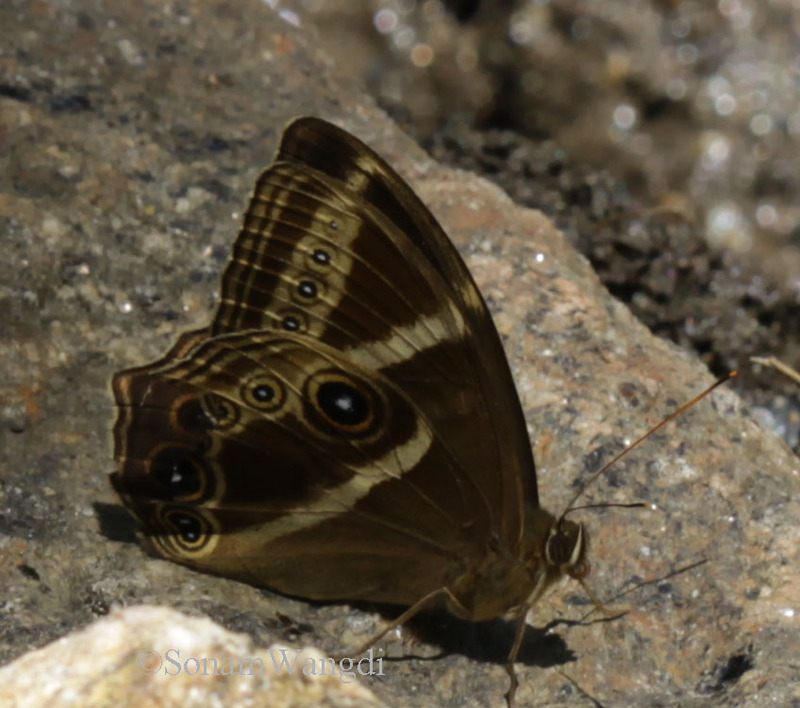 It was only on our way back, near Dochula we got the picture of this Lethe.sp (i have not been able to identify it). 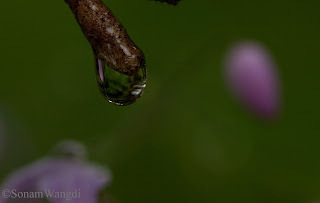 But nevertheless, I got some interesting photographs of Flowers & Nature. For the Ones, to whom Lungdar blessing is not enough. The feathery inflorescence, i dont know of what. But many of these were lying on the foot path, so thought why not include this as a part of my nature collection. 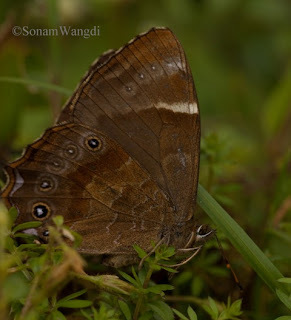 This butterfly, Bhutan Tree Brown was very recently rediscovered in Bhutan. It was first discovered in Bhutan sometime in 1930s, probably by the same guys who discovered Ludlow's Bhutan Glory. The rediscovery was made by a team consisting of surveyors from the Department of Forests and Park Services of Bhutan along with a researcher from Butterfly Society of Japan. 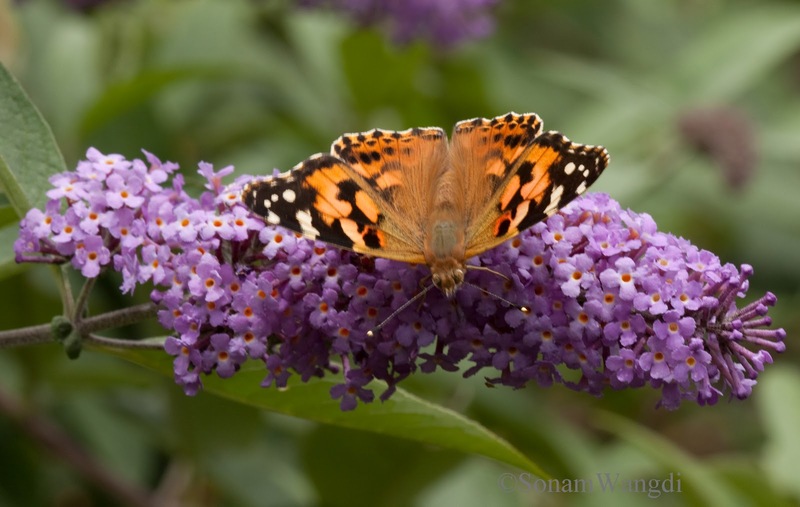 I was among the four who first saw this butterfly. I had joined the team to represent Wildlife Conservation Division to conduct a research on Ludlow's Bhutan Glory (Bhutanitis ludlowi) in Bumdeling Wildlife Sanctuary.